Life Insurance for smokers - Tobacco user level term quotes and rates. Cigars, Cigarettes, Pipe. Buying an affordable life insurance policy can be quite challenging for a smoker. 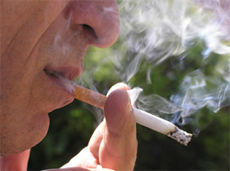 Smokers always pay higher premiums in comparison to a non-smoker - sometimes two to three times more. Therefore it is very important to do research and compare many plans before choosing a policy. In addition, staying healthy, and maintaining a reasonable weight will work in your favor. Being overweight and smoking will increase your rates a lot. You may be wondering how much more will a smoker policy cost, a research of life insurance policies for smokers vs non-smokers reveals some amazing results. For example; a 29-year-old female smoker weighing 115 pounds and standing 54 tall will pay $50-$90 per month for a 30 year term life insurance policy valued at $300,000. The same non-smoker female will only pay $20-$60 per month. A 29-year-old male smoker weighing 170 pounds and standing 5 11 tall will have a premium between $60-$135 for the same policy - this is not cheap. The age factor (29) can drop the Term Life Insurance Policy to 15 years, the smoking male still pays on average $30 - $54 per month, which is more than a nonsmoking female would pay for a 30 year term policy. Click Here for Own Quote! Smokers might sometimes view the increase in level term life insurance rates as discrimination, but its important to analyze this from the insurance companys point of view. In general, smokers (nicotine users - cigars, pipe, or cigarettes) stay out of work more often than non-smokers due to respiratory problems. It is believed but yet not clinically proven that smoking lowers the immune system defenses, therefore causing smokers to be more susceptible to certain illnesses than a non-smoker. Another reason nicotine users pay higher insurance premiums is because of other smoking-related illnesses that may occur and cause premature death, such as lung cancer, heart attack, emphysema, severe asthma, stroke, and other forms of cancer. Studies done in the last five years also found a connection between heavy tobacco smoking and Alzheimers disease. Click Here - Cigarette Smoker Insurance Quote! When buying life insurance for smokers on a monthly basis, the 10-year level term policy is the cheapest, but other issues must be taken into consideration before making a decision. Term policies expire at a certain date; at that time the policy needs to be converted to whole life, cash it in, or renew the policy. At that point you will be 10 years older, so financially speaking it's safer to invest in whole life ins., in order to keep the premium rates constant throughout your life. A smoker (cigarette, cigars or pipe), who is looking to buy life insurance, should consider several options before making a final purchasing decision. These options include; term life insurance versus whole life insurance and the length of coverage. All of these factors determine the average premium costs. Since smokers will be paying higher premiums, its important to spend your money wisely. Several sites are available on the Internet for quoting; some don't require any personal information. Others don't always provide with a quote at that time, but will call or email you with the cheapest prices they find. The most important thing is to read the policy carefully and realize what you are getting for your money. Do a thorough research before making your final decision. When it comes to most insurance companies, it does not matter if you are an occasional cigar smoker or an habitual cigar smoker - they will consider you a smoker and your rates will be the same as someone that smokes two packs of cigarettes per day. I know, it is unfair, but that's the way most life insurance companies operate. There are, however, some companies that are friendly to cigar smokers and will work with you to get you a better rate than that of a smoker. One such company is Prudential. Prudential is aware that there are many men and women out there who enjoy a cigar once in a while without being "true" smokers, like, for example, smoking a pack or more of cigarettes per day. Thus, making Prudential one of the friendliest companies towards cigar smokers. Click Here to get an instant Smoker Life Insurance Quote! Peter Smith has worked in the insurance and financial industries for over 15 years, first starting as an actuary, but now, dedicated only to helping people find the right life insurance coverage.